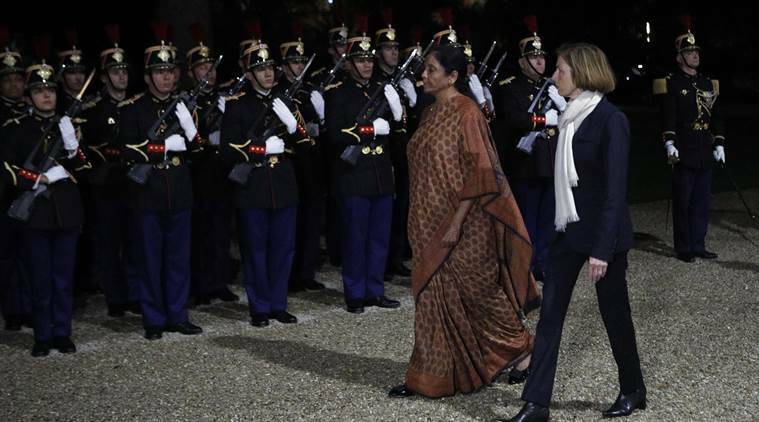 In the midst of a massive controversy over the Rafale deal, Defence Minister Nirmala Sitharaman Thursday held wide-ranging talks with her French counterpart Florence Parly on ways to deepen strategic and defence cooperation between the two countries. The talks were held under the framework of the annual Indo-French defence ministerial dialogue which was agreed to during the summit meeting between Prime Minister Narendra Modi and French President Emmanuel Macron in March. Official sources said the two defence ministers held a one-on-one meeting followed by delegation level talks, covering a range of bilateral, regional and global issues of mutual interests. They said both sides deliberated on co-production of military platforms and weapons by the two countries besides expanding cooperation between their armed forces, particularly in the maritime domain. It was not immediately known whether the Rafale deal figured in the talks or not. Sitharaman’s visit to France came in the backdrop of a huge controversy over the procurement of 36 Rafale jets from French aerospace major Dassault Aviation. In a report Wednesday, French publication Mediapart said Dassault Aviation, the manufacturer of Rafale, had to choose Ambani’s firm Reliance Defence as its offsets partner in India as a trade-off for getting the deal. When asked about the allegations, Sitharaman said that offset obligations for the deal are mandatory but not the names of the companies. The latest report followed former French President Francois Hollande’s comments last month that France was given “no choice” on selection of the Indian partner for Dassault and the Indian government proposed the name of the Indian company. Hollande was French president when the Rafale deal was sealed. Officials said Sitharaman will visit a Rafale manufacturing facility near Paris on Friday to take stock of progress in their production. Earlier this year, France was pitching for starting negotiations for procurement of another batch of 36 Rafale jets by India. However, New Delhi was not keen on pursuing it. In April, the Indian Air Force started the process to acquire a fleet of 114 fighter jets and Dassault Aviation has emerged as one of the key contenders for the contract. Prime Minister Narendra Modi had announced the procurement of a batch of 36 Rafale jets after talks with the then French President Hollande on April 10, 2015 in Paris. The final deal was sealed on September 23, 2016. The Congress has been alleging massive irregularities in the deal, saying the government was procuring each aircraft at a cost of over Rs 1,670 crore as against Rs 526 crore finalised by the UPA government when it was negotiating the deal. The Congress has also been targeting the government over selection of Reliance Defence as an offset partner for Dassault.